Abstract: Recent and future technology development make intelligent transport systems a reality in contemporary societies leading to a higher quality, performance, and safety in transportation systems. In a big data era, however, efficient information technology infrastructures are necessary to support real-time applications efficiently. 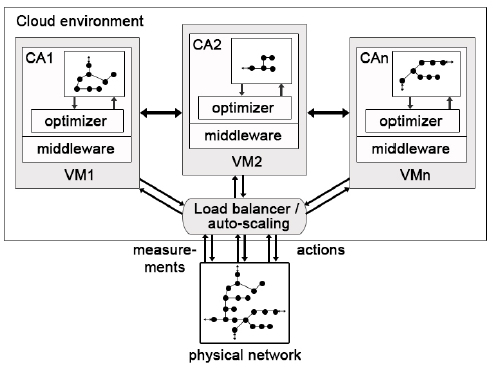 In this paper, we review different control structures of model predictive control and embed them in cloud infrastructures. We especially focus on conceptual ideas for intelligent road transportation and explain how the proposed cloud-based system can be used for parallel and scalable computing supporting real-time decision making based on large volumes and a variety of data from different sources. As such, the paper provides a novel approach for applying data-driven intelligent transport systems that utilize scalable and cost-efficient cloud infrastructures based on model predictive control structures. Reference: L. Heilig, R.R. Negenborn, S. Voss. Cloud-based intelligent transportation system using Model Predictive Control. In Proceedings of the 6th International Conference on Computational Logistics (ICCL'15), Delft, The Netherlands, pp. 464-477, September 2015.